Table tennis players Terry Pentecost, left, watches as Jonathan Paretsky serves during a match Thursday. Paretsky built a custom room in his home that was painted, lit and designed specifically for playing table tennis. It’s not often that, say, water polo or fencing gets face time on ESPN. So for fans of some lesser-known sports, the Olympics are a big deal. It’s their chance to watch their beloved sport on the largest of stages. If you didn’t know that Wang Hao is the top-rated men’s table tennis player in the world, or that Steffen Peters is America’s best hope for dressage gold, don’t worry. There’s plenty of time before Friday’s opening ceremonies to learn about the Olympic sports that aren’t gymnastics, swimming or track and field. Here are four of those sports, and the Lawrence residents who love them. To Jonathan Paretsky, table tennis is more than just a game – it’s a sport. With a large European and Asian following, table tennis is considered one of the world’s most popular sports. Added to the Olympic sport roster in 1988, table tennis is known to most Americans as Ping-Pong, a Parker Brothers’ trademark. But many table tennis players find the term “pingpong” too relaxed, bordering on offensive by reducing the sport to mere recreation. And Paretsky certainly takes the game seriously. 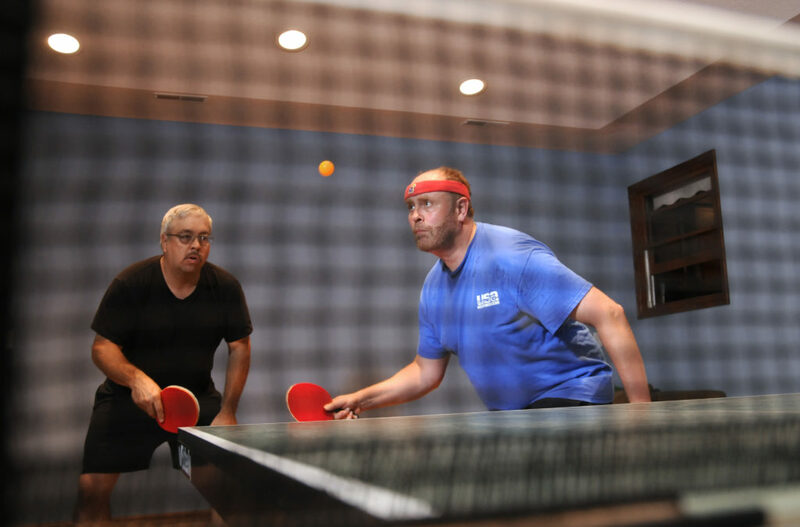 He’s been playing for 34 years and runs the Lawrence Table Tennis Association, a group that meets weekly to play. But Paretsky doesn’t just play. Paretsky doesn’t let Americans’ disinterest in the sport get to him. He plans to watch the 2008 Olympic games and continue to meet with local table tennis players most Tuesdays at the Holcom Park Recreation Center from 7:30 p.m. to 9:45 p.m.
Rebecca Rigdon, of Lawrence, practices with Solei, a mid-level dressage horse, at Freedom Hill Farm in Olathe. 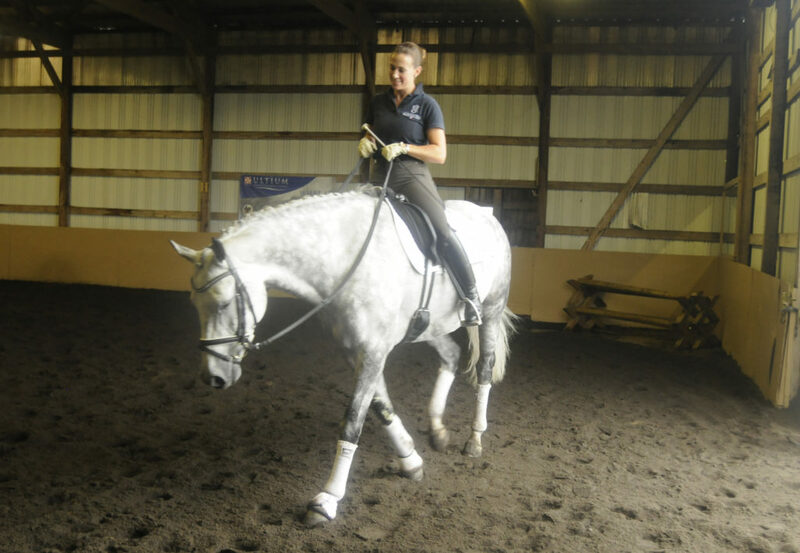 Rigdon has trained with Steffen Peters, who is a member of the U.S. Olympic dressage team. Dancing horses. Sounds more like a child’s dream than an Olympic sport. But in the world of dressage, it’s both. During the 2008 summer Olympics, which start Friday, horses and riders from around the world will compete in dressage, a sport born out of military training for cavalry horses and later put in an arena and set to music. Rebecca Rigdon, a Lawrence resident who trains at Freedom Hill Farm in Olathe, has been competing in the sport since age 7 and has had horses at the sport’s Olympic level, Grand Prix. If those stars aren’t in alignment, and a horse in the Olympics has a bad day, it can mean years worth of work down the drain. Rigdon says it often takes 10 years to get a horse to the Grand Prix level. Beginning at age 3, dressage horses work through several national and international levels before getting to Grand Prix. The tests are composed of a series of required movements performed across a field. Getting a horse to do exactly as its told in competition – to music no less – is nothing short of a miracle of “reward and repeat.” Rigdon spends hours per day working with her horses to perfect it. The U.S. team of Steffen Peters, Debbie McDonald and Courtney King-Dye will compete Aug. 13 through 19. Preston Foster,11, Tonganoxie, tests his skills at an archery class at Prairie Park Nature Center, 2730 S.W. Harper St. The center recently began offering the classes. The highly structured archery class that Tasha Schultz teaches at Prairie Park Nature Center fits the precision of the sport. Two whistles mean it’s time for her young students to pick out their bows. Next, they get in stance, one foot positioned in front of the other. “Bows on toes,” Schultz reminds the group. Next, positioning the arrow, drawing back and aiming. One whistle, and it’s time to shoot. 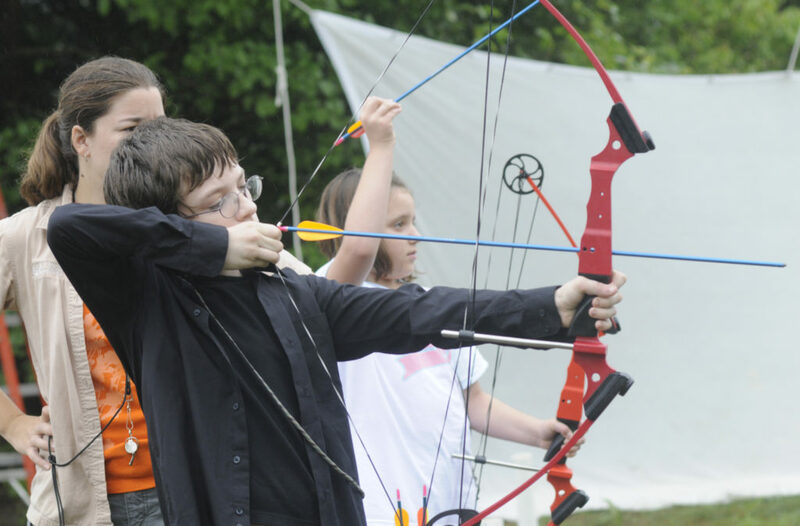 Archery classes are new to Prairie Park Nature Center, according to Marty Birrell, nature intepretive supervisor. Prairie Park, 2730 S.W. Harper St., is able to offer the classes through funding from the Kansas Department of Wildlife and Parks, the city of Lawrence and other agencies. Grants covered most of the $3,000 needed to set up the program, Kizell says, and staff underwent teaching certification to ensure student safety. “We weren’t ready to add the classes in time for our (latest) brochure, but classes will continue into the fall. We hope to see a lot of interest,” she says. K.C. McLaughlin, 9, improves his accuracy with nearly each shot, particularly after Schultz ties balloons to the bulls-eyes for the final round of practice. McLaughlin says he would like to watch the archery competition during the Olympics and hopes to start using with his own bow and arrow at home. 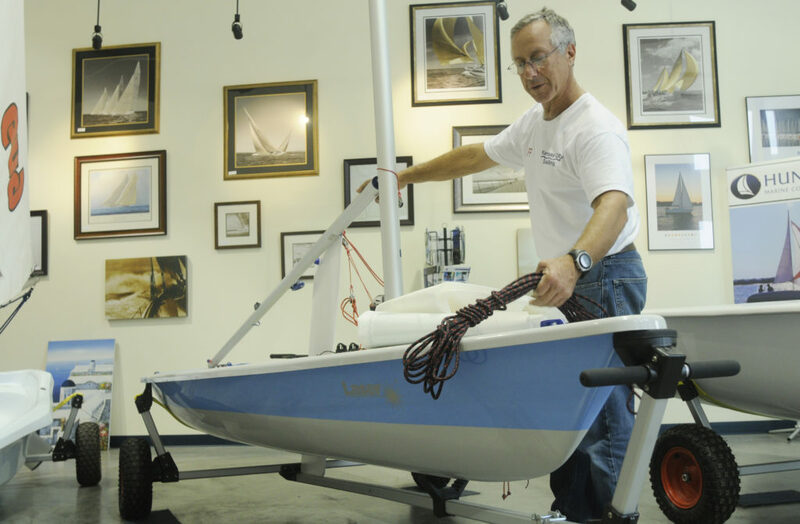 Bruce Liese, owner of Kansas City Sailing at 725 N. Second St., sets up a Laser, one of the type of boats to be featured in the Summer Olympics. Not all sailing is smooth sailing. Bruce Liese has learned that firsthand. Once, when Liese was captain of a commercial charter sailing around the San Juan Islands, his boat came dangerously close to sinking. In the middle of the night, as the boat was plugging across the water, it suddenly slammed into an underwater mountain. The force tipped the boat forward and water surged onto the floor. Fearing the hull had been torn, Liese instantly woke the family that was sleeping onboard – a pregnant woman, her husband and two children – and handed out life jackets. Fortunately, for the family and Liese, the collision didn’t tear the hull and no one was injured. But even more fortunately for Liese is the fact that events like these are rare. “Those types of things are very, very uncommon,” Liese says. Liese should know. A big chunk of his life revolves around sailing. He’s the adviser to Kansas University’s sailing club, owner of Kansas City Sailing, a local sailboat shop at 725 N. Second St., and a board member to the Perry Yacht club. Liese has been sailing for 30 years, and he says there is a lot of local interest in the sport – both competitively and recreationally. In competitions, there are two people per boat: skipper and crew. Liese says the crew member doesn’t have to have sailing experience, which opens up the opportunity for someone to learn how to sail by watching the skipper. In a given year, the KU team competes in about 10 events. And many members try to stay active in the summer to stay afloat competitively. Balance, agility, speed, focus, team work. Liese rattles off all of the skills necessary for a good sailing team. And competitive sailors in the United States have most of these skills. Liese says there’s a strong American force in Olympic sailing. The Olympic sailors hit the water on Saturday, and though he won’t be watching – he’s more a doer than a seer – Liese will be tracking America’s progress online and through newspapers.